Historical Note: First burial here was in 1939. Within the fenced cemetery a memorial has been erected in the center. 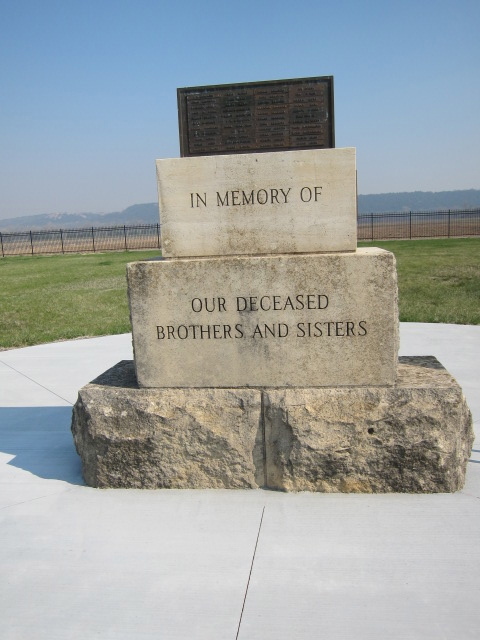 On the south facing wall, it reads: “In Memory of our Deceased Brothers and Sisters.” A bronze plaque on the east side reads: “This Memorial Contains the Names of All Known Children who were residents of the Rebekah-I.O.O.F. Home.” There are 219 names and each name is a separate bronze plate. These names are listed in an article, “Residents of the Rebeka-I.O.O.F. Home,” page 74, Kansas Kin quarterly, Vol. XXXVIII, No. 4, November 2000, published by the Riley County Genealogical Society. Directions: From Manhattan Take KS-K18 tot Skyway Dr exit. At the traffic circle, take the 2nd exit onto Skyway Dr for .3 mile. Turn right on Eureka Dr for .4 mile. The cemetery is on the right (north) side of the road.